He describes his music as “eclectic on many levels” and through the looking class of Black Australia, he changes the perspective on how see at everyday things we might think are mundane. Robbie’s newest songs are a testament to his conviction that there are so many stories out there which, if told, would change the world as we presently see it. 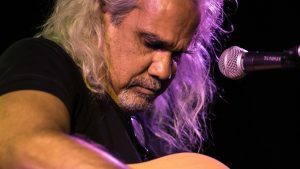 Robbie has played and collaborated on many musical projects and performed with and alongside many singer songwriters including Archie Roach, Bart Willoughby, Kutcha Edwards, Dave Arden, Shane Howard, Dave Steele, Neil Murray, to name a few. He also mentors many emerging artists that are now navigating their way on the musical train.